While I didn’t try many restaurants in Panama City, I’m going to go out on a limb and say Donde José is one of the best! Actually, I don’t even think I have to go out on a limb to say that, as it is one of the best restaurants anywhere where I’ve been. The eight-course tasting menu is unique and fun! I figured out why the restaurant is called Donde José …where is José. It’s because there is NO sign! Just kidding, I don’t know from where the name originates except that the owner is José and there really isn’t a sign! Wandering around with my google maps in hand, I found a door to a non-descript entrance at this corner restaurant. A casual door man asked if I was here for Donde José as he politely opened the door for me. A staff member quickly greeted me and asked if I had a reservation. Yes, of course. I reserved a spot for one online which requires a $20 deposit for the $85 meal assuming there is availability. They gladly accepted me for a mid-week reservation and explained via email that I must arrive no later than 6:45 for my 7pm dinner as all 16 guests are served the same menu simultaneously and there is another seating later, at 8:30. As such, I expected we would all be seated family style at one or two large tables. Instead, the small dining room held six tables. Two two-top tables and four four-top tables though the four-tops only seated three people due to table side cooking. The menu listed a variety of interesting dishes with unique descriptions which made me wonder what might be coming. Examples of the playful descriptions of plates include Neither Bread Nor Butter, With Caribbean Flow, Everyday Stuff and Coffee With My Grandpa. After being seated and browsing through the drink menu which includes an optional wine pairing, my young server whose name I didn’t understand brought out my first course, Neither Bread Nor Butter. With each course is a story about Panama. Apparently bread and butter is popular among Panamanians, so the restaurant poked some fun and served neither. 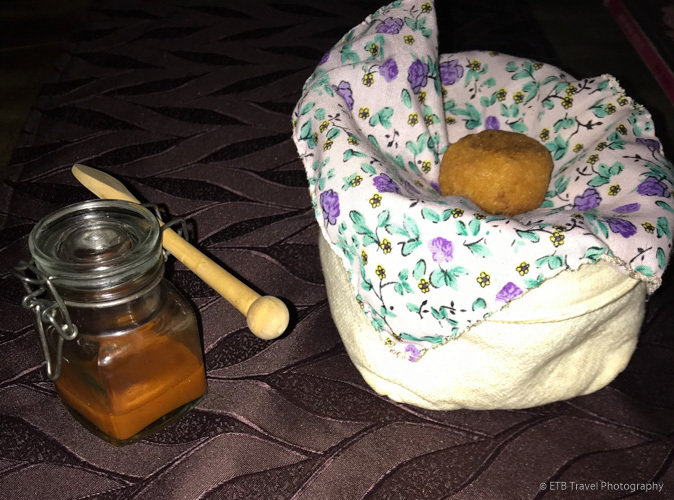 Instead Donde José served a bite of fried cheese with a fancy smoked tomato sauce. Perhaps this was the American influence on Panama. It was probably the fanciest piece of fried cheese I have ever eaten, and it melted in my mouth…delicious! The next course, Caribbean Flow, included three bite sized appetizers. The first plate expressed the Caribbean influence in Panama and featured Caribbean ceviche. A cup of flavored lime juice accompanied a thin slice of tuna atop arugula. While the juice was slightly tart, the tuna was extremely fresh. The Spanish discovered Panama, as such the next small bite at Donde José accented a Spanish clam resting on a bed of sand rice with a slice of prosciutto. The “sand rice” perplexed me. I wasn’t sure what to expect. It seemed more like crispy wheat germ or something. It’s amazing how what appears to be such an odd pairing can taste so good. The fourth small bite served at Donde José promoted the Chinese who immigrated to Panama in order to build the Trans-Isthmian Railroad and the French and American Canal. My 28-year old server who look 17 served me a coconut dumpling with a splash of soy sauce for dipping. Its texture and sweetness were perfect. I moved on to the small plate items after I cleansed my palate with a piece of pine apple. The next dish on the menu at Donde José was called Carnavales in Penonome 1986. My young server explained during the Carnival Festival many people buy meat skewers at the street festival. As such, Donde José serves meat, cooked table side, to be eaten as a taco in a tortilla with a flower and vegetables. It might have been the best thing on the menu! I’m glad I didn’t find out until later that it was tongue. Now I know why my stepdad likes it so much…tender and delicious! I may have to rethink what type of meat I buy at the store. After scarfing down the beef taquito, I made a lettuce wrap with chacote, baby corn, sweet potato and fake caviar (made with black quinoa). I loved the presentation of each dish. I took a moment to admire the artistic creation before I devoured the food. The food kept coming and I was treated to The Pearl Island plate, which featured shrimp, next. It is so named for the beautiful island chain around Panama. The shrimp were laden in a cashew cream sauce. Though the bites were small, I was starting to get full and suddenly I was served half a Cornish hen stuffed with rice. This dish represented the “Everyday Stuff” as it is common for Panamanians to eat chicken and rice. My server also gave me permission to eat the chicken with my hands like Panama residents do! After an hour of eating and sipping on my spicy jalapeno drink, it came time for dessert. Admittedly, for an eight-course tasting meal, the service was very fast, which I personally appreciated as I was eating by myself. The first dessert course at Donde José featured shaved ice, and why wouldn’t it? Instead of ice cream carts or hot dog stands, locals wheel around a cart of ice! They scrape off pieces of ice and add flavored syrup. The shaved ice at Donde José was slightly fancier that on the street and included chacote, a hibiscus flower, banana vinegar and burnt caramel. A tasty treat! I had to bid farewell to my cute server from Boquete (where I’m going next) after having Coffee with My Grandpa. It’s common for Panamanian kids to hang around with their grandparents and drink coffee. This coffee was quite a bit fancier though. The cup included a mix of geisha coffee which is made from the most expensive coffee bean in the world, cheese cake, a crouton and cappuccino froth. It was very rich! Donde José was only two blocks from my hotel, so after my delicious meal, I strolled my satiated self back to the apartment. What a lovely evening! I highly recommend trying Donde José. Sounds delicious! You are an adventurous eater!